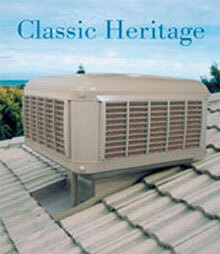 Hearth House Australia’s No.1 CoolBreeze Evaporative Air conditioning dealer. CoolBreeze evaporative air-conditioning systems cool your home the same way nature cools a rain forest – by blowing air across water so it evaporates, reducing the temperature and refreshing the air. With CoolBreeze there is a continuous flow of air into your home. 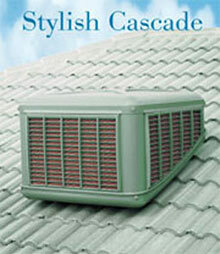 Fresh and cool, this airflow forces out stale air, which is never re-circulated. With its low energy costs, CoolBreeze is not only better for your family, it’s better for the environment as well. With CoolBreeze you have all the comforts of air-conditioning at your fingertips, enjoying cool 100% filtered air all summer. CoolBreeze uses only the finest quality direct drive motors. 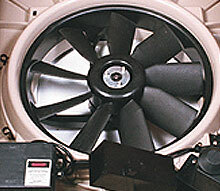 “Direct drive” means that the fan is connected directly to the motor resulting in lower noise levels, maximizing power output and reducing running costs. For example our 17kW cooling output machine in the D255 model is powered by a 1000 watt motor. 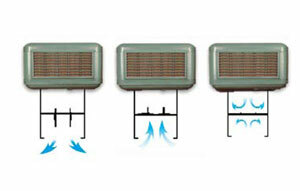 CoolBreeze is the only system to feature an exhaust mode. Only CoolBreeze allows the fan to be reversed in the air-conditioner, enabling the system to operate as a whole of home exhaust fan. Great to exhaust all that hot air out of your home prior to cooling (and also great when you burn toast). CoolBreeze features a state of the art MAGNA SENSOR water management system. 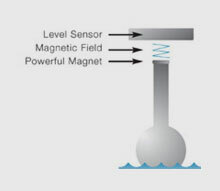 The simplicity and accuracy of the Magna Sensor uses magnetic field technology to measure and regulate water flow and levels to within 1mm. With the unique CoolBreeze Magnet Water Level Sensor, We guarantee that the water level in your unit will never need adjustment! As there is no washer to wear in our water level sensor, we have totally eliminated the possibility of this failure as well. The solenoid is only powered when the unit requires more water, and best of all, the pump is turned off when the water level is too low. CoolBreeze has an exclusive pre wash and end of day rinse cycle. This function ensures the unit is regularly flushed clean eliminating the chance of dirt or scale build-up and reducing costly service call outs. CoolBreeze cabinets are made with an all polymer casing. It is important not to choose just any polymer. Some brands use polypropylene, as it is amongst the cheapest forms of plastic available. 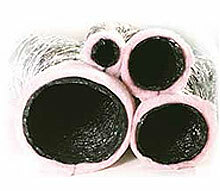 CoolBreeze uses only Luran S, a BASF engineering polymer designed specifically for outdoor applications. This polymer is used in the manufacture of car parts, including bumper bars and car dashboards! CoolBreeze uses a unique counterweight drain valve. CoolBreeze revolutionized the drain valve with its exclusive patented counter weight drain valve. This system works on the principle of the weight of water and a leverage system to close the valve. As long as there is gravity, this valve will not fail. 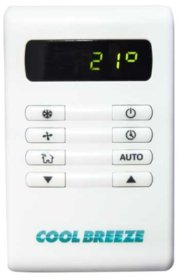 CoolBreeze QA automatic controller (optional). Bushfire Safety Mode (QA Only). 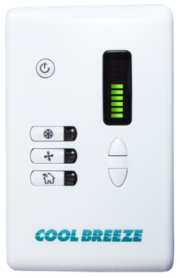 The CoolBreeze QA series wall controller has a unique feature of “PUMP ONLY” mode that operates the water pump without turning the fan on. This is the recommended way of using your evaporative air during possible ember attack from nearby bush fires. Only CoolBreeze offers this feature. With 2 unit shapes and the choice of 5 colours CoolBreeze will ensure you not only stay cool but your house will remain the best looking in your street. 4 Seasons Weather Seal (optional). 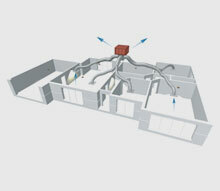 Automatically turn off airflow to your home when the system is not operating. This prevents cold drafts entering your home as well as heat loss in winter. Doubles your cooling effect by creating a cool insulating barrier between the roof and ceiling. 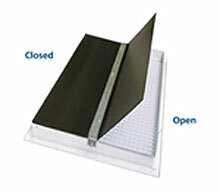 Also it acts to release pressure reducing the need to open doors or windows in the home. Fully tested to comply with Australian and International Standards AS4254 and UL181, the ducting we use passes fire rating, strength and durability tests. 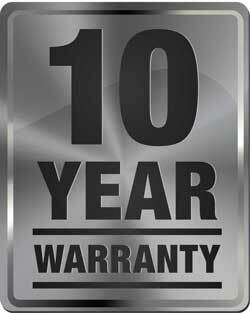 CoolBreeze offer a 5 year warranty on parts and 3 years labour. The CoolBreeze cabinet has a structural warranty of 10 years. Quietflo ducting and components has a 25 year warranty. Hearth House offers a 2 year installation warranty.